Robin Hood and Mulan retelling? Two of my all-time favorite stories combined and set in feudal Japan? YES PLEASE! Thoroughly enjoyed reading this story and thought of a dozen young girls I wanted to gift it to. Now that I’m thinking about it, I can’t recall any times in this story where our protagonist, Markio, was described as beautiful. Aside from mentioning her attire and how she cut her hair to portray a boy, the emphasis really was on her intelligence, inquisitive nature, and desire for justice. Like Mulan, this story is about a girl who doesn’t quite fit in because of her interests in intellectual pursuits and a set of circumstances that lead her to disguising herself as a boy. The rest of this story follows an interesting story line full of magic, cunning, and battles both of blood and wits. This story was set up for what I’m anticipating to be an incredible second book. 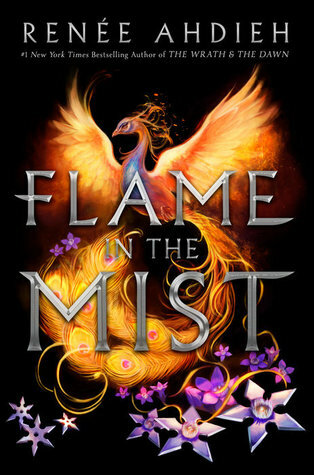 While I did enjoy Flame in the Mist a lot, it’s all the things that we won’t know until the second and final book that I’m dying to know. The true enemy in this story is subtle but ever present, until the moment you realize everything is more complex than you thought. It’s following a string until you look up and realize you’re caught in a web. I ended this read basically unsure of everything, but not in a way I hate. In a way that lends itself more to anticipation and mystery than confusion. Mariko was stubborn but not annoyingly so, which MATTERS TO ME. haha. Honestly looking forward to the next book in this duology and seeing what Renee has in mind for these characters!